The death of humorist Stan Freberg yesterday hit a lot of radio people hard. Many of us either wanted to get into radio, or wanted to be creative in a particular way, because of an early exposure to Freberg’s work. A lot of us (and I put myself in this category) admired him because his vision was so uniquely bent, and his critiques of media, music, and advertising were so perfect. I’ll let other people on the Interwebs talk about his brilliant radio commercials or his groundbreaking album Stan Freberg Presents the United States of America. Instead, I’ll write about Freberg’s appearances on the singles chart over the years. Freberg scored with both comedy bits and parody songs. His first chart single, “John and Marsha,” (1951) was the former; his next four were the latter. His biggest hit came in 1953, when the Dragnet parody “St. George and the Dragonet” spent three weeks at #1. Freberg employed two of the most famous voice actors in history, Daws Butler and June Foray, who also appear on the single’s B-side, “Little Blue Riding Hood.” Only a few weeks after “St. George” hit #1, Freberg went back to the Dragnet well with Butler for “Christmas Dragnet,” and he started 1954 by recycling his first hit into “John and Marsha Letter,” which charted briefly. Later in 1954, the topical “Point of Order” would parody the Army/McCarthy hearings. 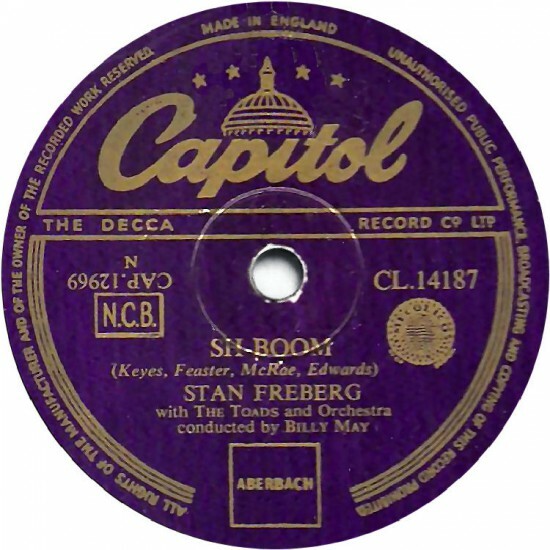 At the end of 1954, Freberg charted with a parody of “Sh-Boom,” the original of which had become one of first big hits of the rock ‘n’ roll era. Freberg plays a record producer who repeatedly warns his singers that if they expect to have a hit, they need to mumble. Freberg would frequently skewer the kids’ music, releasing versions of “Heartbreak Hotel” and “The Great Pretender.” Freberg’s last chart hit, “The Old Payola Roll Blues,” (1960) is explicit in its belief that rock ‘n’ roll success requires no real talent—just a smart producer and payments to disc jockeys. In 1957, Freberg hit with a single that most people (of a certain age) have heard: “Banana Boat (Day-O),” a takeoff on the Harry Belafonte hit that features another famous voice, that of Peter Leeds, as a man who keeps interrupting the singer for being too loud, shrill, and/or piercing. It made #25 on Billboard‘s Best Sellers chart and #43 on the Hot 100. Freberg starred in a radio sitcom in 1954, but his creative vision was constrained by the sitcom format. The Stan Freberg Show, co-starring Butler, Foray, and Leeds, ran briefly in 1957, but couldn’t attract a sponsor and ran only 15 episodes. The show was the launching pad for the Lawrence Welk parody “Wun’erful, Wun’erful,” which charted at the end of 1957. It’s my favorite Freberg record, featuring a runaway bubble machine and an irreparably damaged accordion. Although he would win lot of honors and make a lot of money from advertising, he could also take a dim view of it. He turned down tobacco advertising for his 1957 radio show, contributing to its eventual cancellation. And at Christmas 1958, “Green Chri$tma$” sharply criticized companies trying to cash in on Christmas, suggesting they’d forgotten the real meaning of the season. Radio jocks, who knew how clever it was, loved it; radio sales executives did not. According to Wikipedia (so who the hell knows), a DJ in New York City who played it was told he’d be fired if he played it again, and a station in Los Angeles made sure it didn’t air within 15 minutes of any commercial break. Twenty-five years later, the radio station I worked for played it a few times, but only after a great deal of soul-searching, and, if I’m recalling correctly, with a disclaimer. It really is remarkable how harsh Freberg’s criticism of Christmas commercialism is. “Green Chri$tma$” simply destroys the cynicism of advertisers looking to make a buck on the holiday. (It still hits pretty hard today—or it would, if anyone still cared about such a thing, which no one does.) Despite the record’s merciless tone—it ends with the ringing of cash registers—Coca-Cola and Marlboro, both recognizably satirized in it, responded by asking Freberg to design ad campaigns for them. Freberg had done parody commercials on his 1957 radio show—and the lengthy career in advertising that resulted would win him 21 Clio awards, the highest honor in the ad game. Stan Freberg started as a voice actor in animation before his 20th birthday, and he was still doing it in the 21st century. He was 88 years old. as usual you put this across perfectly (says the guy with the advertising degree). It used to perturb me that critic Dave Marsh railed on Stan as a “rock hater,” as if people nearing 30 years old at the dawn of rock and roll embraced the new music. I have a Capitol 45 RPM on which Green Chri$tma$ takes up both sides of the record. It truly is one of the most clever parodies I ever heard. It’s perfect. It does what all parodies should do: make us laugh while making a a sociological comment.